Special Counsel Robert Mueller said that by September 1st he will to finish his investigation into whether President Trump obstructed the Russia inquiry, according to Rudy Giuliani, Trump's attorney on the matter. Waiting any longer to do so would risk improperly influencing voters going into the midterm elections in November, Giuliani added according to the NYT, reflecting comments made earlier Sunday by Trump in a charged tweet. Mueller reportedly informed the Trump administration of his timeline two weeks ago amid negotiations over the terms under which Trump will be questioned by investigators. "You don’t want another repeat of the 2016 election where you get contrary reports at the end and you don’t know how it affected the election," said Giuliani. That said, the question over obstruction is just one piece of the special counsel's broader inquiry into Russian interference in the 2016 US election. This effort has resulted in nearly two-dozen indictments, including 13 Russian nationals and three Russian companies on conspiracy charges related to an alleged Russian propaganda effort run out of a "troll farm." Giuliani is framing the outcome of Mueller's obstruction probe as pitting the credibility of Trump vs. former FBI Director James Comey - who accused Trump of trying to end the investigation into former National Security Advisor, Mike Flynn. “We want the concentration of this to be on Comey versus the president’s credibility, and I think we win that and people get that,” Mr. Giuliani said, adding that he also would like to see a criminal perjury investigation by the Justice Department into Comey for his role in leaking information cited in New York Times reports last year about his encounters with the president, prompting Mueller’s appointment. 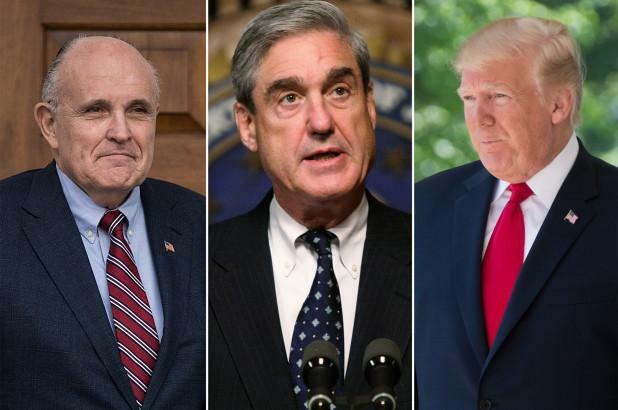 Trump would like the results of Mueller's obstruction inquiry to be made public, according to Giuliani. Trump and his legal team, meanwhile, continue to negotiate with Mueller's team over his interview. Mr. Giuliani said that he and Mr. Mueller’s office were still hammering out the terms of an interview with the president. He portrayed his client as a willing interview subject, saying that in the president’s view, no evidence exists that his associates coordinated with Russia’s election interference. In other words, Trump won't talk to Mueller until after June 12 - ostensibly after he's brokered a North Korean denuclearization agreement, and as recent revelations over the Obama DOJ/FBI spying on his campaign mature through Congressional investigations. By that time, if the talks with North Korean leader Kim Jong Un are a success, Trump may well be on his way to earning a Nobel peace prize (at least according to online bookies) and perhaps have built up enough public support to simply fire Rosenstein, Sessions and Mueller altogether.